I’m a meteorologist. I’m staying behind in the Florida Keys to help save lives. It’s been a long few days here in the Florida Keys. My wife and I started preparing for Irma’s arrival around Labor Day. Usually, that’s a big tourist weekend around here — so there was already a shortage of gas at some service stations. So, when we went to get gas, we were only able to obtain the high-priced stuff. And that was just the beginning. Using FEMA’s emergency supply kit list, we bought at least 14 gallons of water and enough food for two weeks. I’m set to eat Chef Boyardee for a long while if need be, and I hope that I am able to do that over an extended period of time, instead of eating it all during the aftermath of Hurricane Irma. Sadly, that’s the best-case scenario. I’ve lived in the Keys for 16 years, and I’ve never seen a threat like Irma. It’s is probably the most serious threat to the Keys since Hurricane Donna in 1960, which had a death toll estimated in the hundreds. People have taken this storm seriously: Many acquaintances who are usually pretty cavalier about storms have left. I didn’t see many businesses open Saturday; most are boarded up. On Friday, all the hospitals in the Keys closed, and they will remain closed probably until at least Tuesday. Gas was only available at a handful of remaining stations throughout the Florida Keys, if that. A colleague’s roommate living on another island has decided not to evacuate; instead, he’s written his name and Social Security number on his forearm in permanent marker so he can be identified if worse comes to worse. Irma was always projected to take a northward pivot, but we weren’t sure exactly when and where that turn was going to happen. Eventually forecast confidence increased in a northward turn over the Keys. My colleagues and I made the decision to stay behind and sent our families out of harm’s way. My wife and cat departed on Wednesday for Orlando. We at the Key West National Weather Service office are staying to face the storm and assist in our primary mission, which is protecting the lives and property of the American people. We chose to stay because we have a duty. Our storm bunker is rated to withstand 220 mph winds, which means we’re safe from the brute force of the storm. But that doesn’t mean we don’t need to worry. 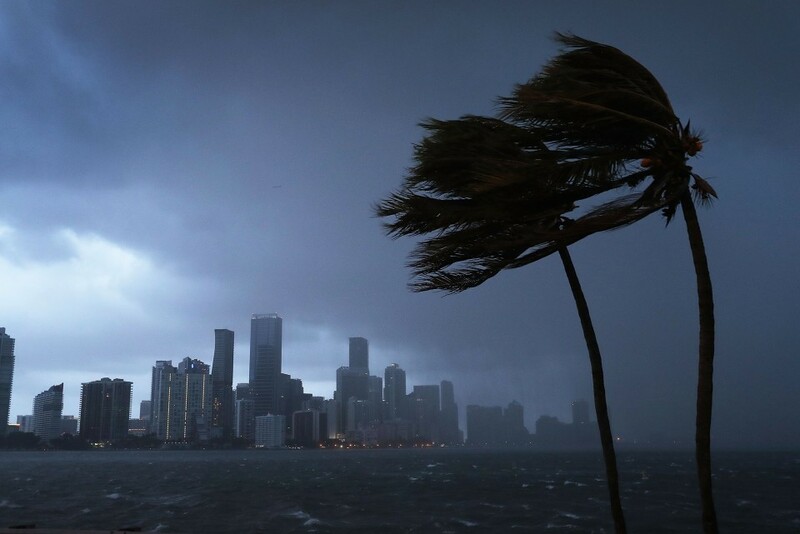 A storm as strong as Irma could easily wipe out bridges connecting the Keys to the mainland, and we could be without power for weeks. But we’ll be here. Mentally, it’s draining: All of us are working 12-hour shifts; in between we try to secure our own homes and properties as best we can. But right now, our focus is on protecting the lives and property of the people left behind here in the Keys. My colleagues and I can still save lives. As conditions become increasingly dangerous tonight, we’re going to monitor the radar closely, watching rain bands, keeping an eye on damage and getting the word out to locals about where the worst points of the storm are and how they’re moving. When Irma comes closer, we’ll focus on the eye wall — the most dangerous part of the storm — and will issue an Extreme Wind Warning when destructive winds are expected to cross an area. As soon as we have news like that, we get that warning to the public to alert them to get to an interior room, or their safest place, as quickly as possible. There are refuges of last resort set up throughout the Keys, and we can also help get information about those shelters whereabouts to people who are otherwise stuck in vehicles or unsafe structures as the storm intensifies. We’re using social media — such as Twitter and Facebook — to keep in touch with stranded people on the ground. We’re also working with emergency management services and the local sheriff’s office to help them position first responders. Using our monitoring equipment, we can let emergency personnel know when sustained tropical storm-force winds have ended, so they can enter the field to rescue victims with minimal risk to their own lives. Timing, in these kinds of disaster scenarios, is crucial. I joined the National Weather Service in 1999, visited Key West on vacation in 1997 and fell in love with it. I transferred to this office in 2001. For the past 16 years, I dedicated myself to keeping this place and its people informed and safe — and I know my colleagues feel just as committed to serve. As I watch Irma progress, I increasingly fear what the aftermath is going to look like. When the worst of Irma passes and we emerge from the bunker, perhaps Monday, I hope I see the beautiful island I’m familiar with, and not just flat devastation stretching out to the sea. But whatever we find when we open those doors, we’ll be here. William South is the Tropical Weather Program manager and social media manager at the National Weather Service office in Key West, Florida.